I hope that your week has been going fabulously and that you're looking forward to a fun-filled weekend! Friday is in sight and I've never felt more relieved after having such a long week. I recently ordered from Colourpop Cosmetics when they were having a 24 hour sale where you received one free full-sized highlighter for every $20 you spent. So, naturally I ordered $40 worth of goodies to reap the rewards of free shipping and two free highlighters! Like I always say, if it's free it's for me. I already have one of the highlighters in the shade Lunch Money and I absolutely adore it. The two shades I chose to receive through this sale were Wisp and Over the Moon. You can purchase each of these shades through Colourpop's website for $8. This is a crazy-cheap price for some amazing quality highlighters, so I highly recommend you get on those asap! In the swatches above, the lefthand picture shows how the shades appear when shooting with my flash with a diffuser on it while the righthand picture shows how they appear without a diffuser on my flash. The righthand picture gives you a good glimpse into how light reflects off of the colors of the sparkles in each highlighter. 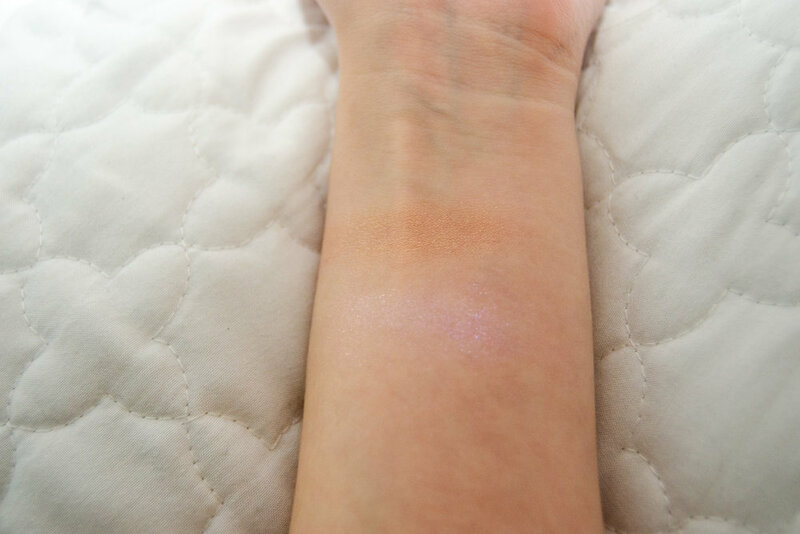 Wisp is a gorgeous bronze highlighter with flecks of gold sprinkled throughout it. It is incredibly pigmented on its own. This shade gives my pale cheeks a nice, warm glow and blends effortlessly into my skin. I think it would look especially lovely on olive skintones. Over the Moon is an iridescent highlighter with a pinky base. It contains electric blue, violet, and hot pink duochrome which makes it super unique. That was really the selling point of this shade for me. The base of Over the Moon is somewhat lackluster as it is not super pigmented on its own, but this baby is packed full of glitter. I think this shade would add some pizzazz to spunky looks. I suspect that it will perform beautifully when applied on top of a white or champagne-toned highlighter as well. Like all of Colourpop's highlighters, each of these shades is buttery and smooth. Although these are powders their textures are almost that of a cream - that's just how buttery they feel! They apply much more pigmented when using your fingers instead of a brush. Overall the quality of Colourpop's highlighters are well worth the price. I would highly suggest them if you need to add some glow to your life! What are your favorite Colourpop highlighters? Leave a comment below with shades I need to try out!